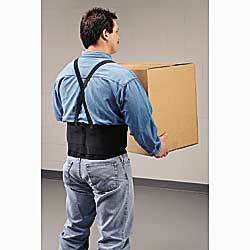 8" elastic power net belt has 4 non-conductive stays that promote proper posture when lifting or bending. Fits comfortably and stays securely in place. Other features include: adjustable two stage hook and loop closure, rubberized stay covers, and removable elastic suspenders with hook and loop tabs. Washable. SPECIFY SIZE: A - Small (24"34"), B - Medium (32"42"), C - Large (42"52"), D - X-Large (52"62"). IN STOCK.